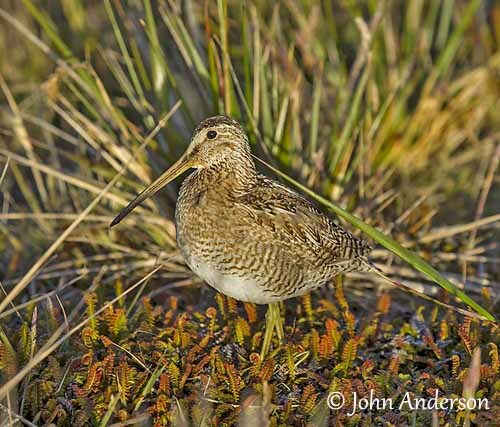 The Magellanic Snipe is sometimes considered a full species, but it is more often regarded as a subspecies of Gallinago paraguaiae. This bird of the family Scolopacidae was described in 1828 by Phillip Parker King, of the Royal Navy. The species was named Scolopax magellanicus. The first specimen was captured in the Strait of Magellan, S Chile. The adult has blackish upperparts with yellowish-white spotting. We can see a whitish to ochraceous V on the back. The wings are brown and finely vermiculated and spotted yellowish and whitish, and there are several larger black spots. The tail is white barred cinnamon. On the whitish underparts, chin and throat are white, whereas the breast is pale buff streaked light brown. The flanks are barred brown. The belly is white. Vent and undertail-coverts are white barred brown. The plumage colour is usually warmer than in nominate race. On the pale buff head, we can see conspicuous blackish and yellowish stripes starting from the face and extending to hind crown and nape. The lores are black. The cheeks are streaked brown. The long (about 70 mm) flexible bill is straight. It is greenish-yellow with blackish tip. The eyes are dark brown. Legs and feet are yellowish-green. The Magellanic Snipe feeds on invertebrates such as insects, larvae and worms, caught with the long bill. Some plant items may complete its diet. It forages while probing in the mud by vertical, rhythmic probing. The preys are detected by touch, thanks to the flexible bill tip. During the breeding season, the male establishes a territory, and gives advertising calls from an elevated place. These rapid calls are named “yakking”. In order to attract a female, it performs aerial displays. It circles high in the air. The high-speed descent is accompanied by noises produced by the quivering tail feathers and the wings. The cryptic plumage allows the bird to escape dangers by remaining motionless on the ground. 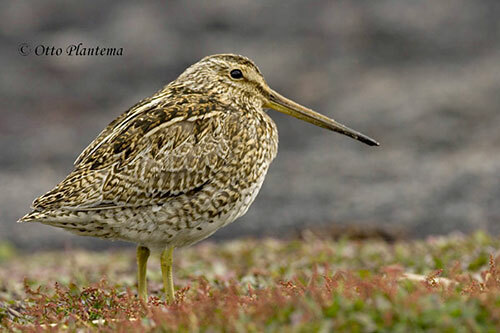 The Magellanic Snipe is migratory, but mainly the birds of Tierra del Fuego. It migrates northwards in autumn because its usual habitats are frozen. It winters in wetlands in the pampas of Argentina, in Uruguay and in S Brazil. It is a summer visitor to Falkland Islands where it frequents heath and grassland. The laying occurs in August, but eggs can be found in November too. The nest is a shallow scrape on the ground, well hidden among the vegetation. It is lined with grass. The female lays 2-3 eggs, and both parents incubate during 19 days. The chicks are precocial and leave the nest very soon after hatching. They are accompanied by their parents while they search for food. 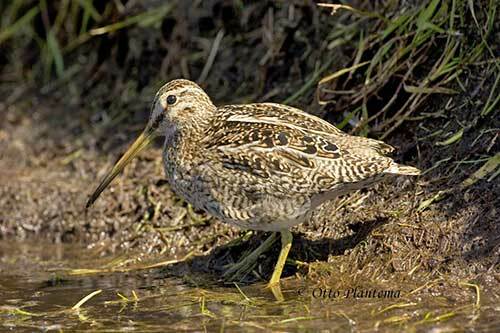 The Magellanic Snipe is common in the low valleys on S Andes and around Valdivia in SC Chile. During the migration, it is not uncommon on the upland plateaux of the Patagonian steppes. The population is estimated at about 8,000 breeding pairs in Falkland Islands. The species is not currently threatened. Both sexes are similar, but the female is slightly larger than male. The juvenile resembles adults, but it has bluish legs and feet rather than yellowish-green. The Magellanic Snipe occurs in C and S Chile and S Argentina, S to Tierra del Fuego. It also occurs on Falkland Islands. It winters northwards in Argentina, Uruguay and S Brazil. 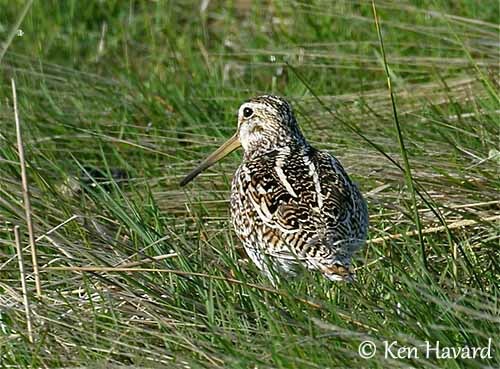 The Magellanic Snipe breeds in peat bogs and grassy pampas and steppes. It can be seen sometimes in open, swampy woodlands. In S Patagonia, it usually frequents areas with tussock grass. It frequents the same habitat types on its wintering grounds. The Magellanic Snipe gives rapid, repeated “chuk” notes from the ground. When flushed, it produces short, harsh, higher-pitched “chik chik, chik chik, chik chik”. The aerial displays are accompanied by hooting, bleating, neighing or winnowing noises. These sounds are believed to be non-vocal noises, but made with the quivering tail feathers and the wings while the bird performs flight displays. However, some of these sounds may probably have a vocal origin.